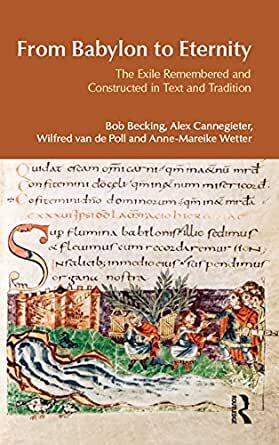 Bob Becking studied Theology and Semitic Languages at Utrecht University. After ten years of parish ministry, he returned to his alma mater, where he was appointed Ordinary professor of Old Testament Study in 1991. He served the Research School for Theology and Religion in the Netherlands as director. His research interests are specifically related to the questions of history and religion of Ancient Israel.Alex Cannegieter read Classical Archaeology at the University of Leiden. She graduated in 1992 with a thesis on the Roman Emperor Maxentius. Since 2001 she studies Theology at the University of Utrecht. Currently she is preparing for her Masters Degree for Biblical Studies.Wilfred van der Poll began his theological education in Leuven, Belgium. At present he is doing a Research Master in Theology at Utrecht University, specializing in the field of Old Testament Studies.Anne-Mareike Wetter has a master's degree in theology from Utrecht University. She specializes in Old Testament and Gender studies and has published several book reviews in these fields.